Are you considering to switch your stack of meeting documents for a tablet and go digital? Don’t know how to start? 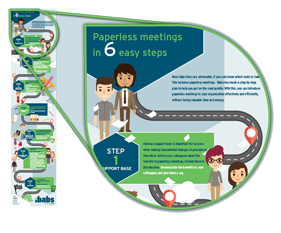 iBabs has made a step-by-step plan to help you get on the road to paperless meetings more quickly. With this, you can introduce paperless meetings to your organization effectively and efficiently, without losing valuable time and energy.